What a surprise! After five years of listening to news of delays, accidents, deaths and so on at the Kárahnjúkar worksite, who would ever have imagined that there was something strange about Landsvirkjun’s portrayal of the whole affair? 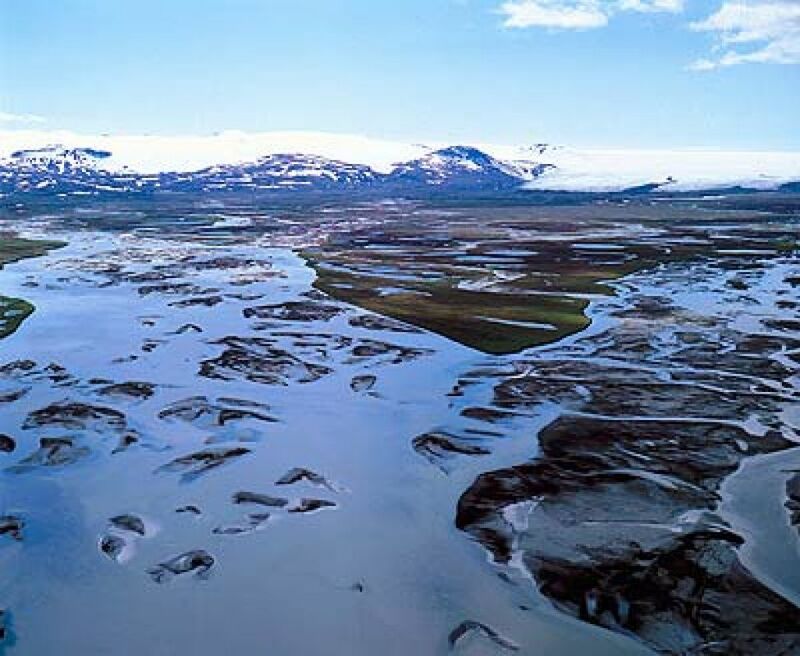 Glacial rivers are not only the lifeblood of Iceland, but also of the whole planet. River water contains sediment in suspension and various substances in solution; glacial rivers, especially, carry a large amount of sediment which increases as the atmosphere grows warmer. Glacial rivers carry the sediment out to sea, where it takes on a new and important role in binding the greenhouse gas carbon dioxide (CO2) with calcium (Ca) and converting it into calcite and other carbonate minerals, immensely important in the ocean ecosystems of the world. Thus glacial rivers reduce pollution on Earth. This effect is greatest in recently formed volcanic territory such as Iceland, and the binding effect increases with rising atmospheric temperature. Glacial rivers bind this gas which, along with some other gases, causes global warming and threatens the future of life of Earth. When a glacial river is harnessed to generate electricity, this important function, and the binding of the greenhouse gas CO2, is diminished. What they generate is not GREEN ENERGY, as the advocates of hydro-power plants and heavy industry maintain, but BLACK ENERGY. Athygli, the public relations company of the National Power Company (Landsvirkjun) woke up this morning to find that during the night a splash of paint had been directed at their offices. A spokesman of the company said the words ‘Iceland Bleeds’ had been written on the house and that he suspected that Saving Iceland was behind this because his company was on a certain “deathlist” on www.savingiceland.org. We can only assume that he means ‘The Nature Killers’ section on this website. Aluminium production in Reydarfjördur begins using energy from the national domestic grid! As Saving Iceland and others pointed out a long time ago Landsvirkjun have proven not to be able to deliver energy to ALCOA on 1 April 2007, as specified in their contract with the multinational. This is highly embarrassing for the Icelandic government and Landsvirkjun, especially as the general elections are coming and the contract they signed with ALCOA specifies that if the energy will not be available on time the Icelandic taxpayer will have to pay penalties to ALCOA. Apparently the government have begged ALCOA not to mention any penalty payments before the general elections on 12 May. Some weeks ago we had the questionable pleasure to listen to denials in the press that these penalties were ever written into the contract! Yet again, this shows the level of lying that ALCOA and the Icelandic government are ready to stoop to. Obviously, it is in the interest of ALCOA that the corrupt government which gave them the wilderness of Kárahnjúkar for free, will stay in power. Aluminium was tapped from the first pot in the new aluminum smelter last weekend. The production process began mid-April. However, there was a low key ceremony 1 April where the Icelandic PM and other dignitaries cut the red ribbon in the factory (above). But clearly the aluminium lobby felt that making too much of the occasion might backfire PR wise in view of the embarrassing fact that the energy was not coming from Kárahnjúkar, not to speak of the defeat ALCAN experienced in the Hafnarfjordur referendum the night before! According to mbl.is, 40 pots are expected to be put into operation during this first stage and the smelter will be running 336 pots, its full capacity amount, by the end of the year when the construction of the smelter has been completed. The smelter in Reydarfjördur has the potential to produce 356,000 tons of aluminum per year. 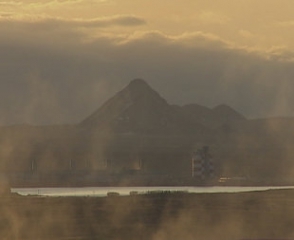 The smelter currently uses 100 megawatts of electricity from the national electricity system, but will need 590 megawatts from the dams in Kárahnjúkar once electricity production begins there… later this year… That is; when Landsvirkjun and Impregilo have scrambled through the last tunnels at what ever the economical and human cost. But what about when it comes to the final billing from the “most litigious company in history”, Impregilo? How much is it going to cost the Icelandic taxpayer when Impregilo have worked out all the delays caused by the deliberately highly inaccurate calculations from Landsvirkjun? Alcoa is building an aluminum smelter in eastern Iceland, part of a project that is reshaping the wilderness. But a coalition of groups says Iceland is sacrificing its most precious asset — its pristine land — to foreign industry. NORTH OF VATNAJOKULL GLACIER, Iceland — In the depths of winter there is almost nothing to see here but snow and rock: snow across the uneven, unearthly landscape, snow on the mist-shrouded mountains, snow stretching to what looks like the edge of the world. But tucked into Iceland’s central highlands, where the Karahnjukar mountain meets two powerful rivers flowing north from Europe’s largest glacier, a nearly completed jigsaw of dams, tunnels and reservoirs has begun to reshape the wilderness.